Choosing a nanny on your own is always going to be tough, after all you’re leaving the most important thing in your life – your child – in someone else’s hands. That’s why Brilliant Nannies is your ultimate resource. On top of the high importance we place on the vetting and screening procedure for our candidates, we also understand that every family is different and that every child has individual needs. Only after all of the above has been proven and we have ensured their suitability do we then add a Nanny to our books. Once you’ve contacted us we’ll get back to you as soon as possible so you can tell us exactly the kind of nanny you want and more about your child’s personality. We tailor our services to suit each family specifically. We’ll then show you a hand picked selection of the best suited nannies based on your criteria and arrange 1-2-1 interviews between you and them, ideally in your home so they can see their work place. We will include the candidate’s CV, photo when available, agency feedback, references and any other relevant documentation. After receiving your feedback we will arrange an interview with your selected candidates. Our interview arrangements are £20 per candidate per interview but this fee is subtracted from the placement fee if you hire one of them. We will then discuss your feedback and arrange a second interview and/or a paid trial. Please note we charge temporary fees for day trials and you must pay the candidate their hourly rate at the end of the day. This process will continue until you find a suitable candidate and you are ready to offer the position. Full agency fees will become payable when a Candidate introduced by the Agency is offered and accepts employment with the Client (verbal or written), and not at the commencement of employment. We will always make sure you are happy with your decision! Anyone who employs a nanny who earns more than £116 per week from April (tax year 2017/18) must register with HMRC as an employer and pay NI contributions and PAYE. Full details of employers’ responsibilities and guidance for new employers are available from the HMRC website but we can supply you with an E-leaflet. 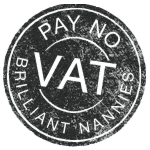 We recommend Way2paye and Nannytax to do the nannies payroll. 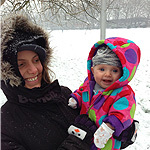 Brilliant Nannies can provide a contract sample of employment (free of charge) for the client and the candidate. Did you know that research shows that families spend an average of 80 hours looking for a nanny without an agency? With our help you can cut that time in more than half without compromising on the quality of childcare for your child.